Perfect holiday home with heated pool and spa bath. Great social spaces for nice dinners or just relax. The house is suitable for a large family or two smaller ones. It takes about 15 minutes by car to the city and 15 minutes to the nearest sea bath where there is the opportunity to rent a boat and experience our beautiful archipelago. There is also good municipal communication within walking distance. Of course there are wi-fi, boxer tv, Xbox and appletv. It is high standard on white goods etc. The perfect home for your url, with a comfortable outdoor pool and whirlpool. The house provides both indoor and outdoor space for social interaction and relaxation. It has a large family or smaller family, which is common to all. With the car you will reach the city center in 15 minutes, until the next lake Badeplatz is only approx. 15 minutes. They also have here the option, one boat to, of the wondschönen Stockholmer Schären. The next public traffic sincerity comes to fruition. The house is naturally equipped with WLAN, both with boxer TV, X-box and Apple TV. The fully featured kitchen provides modern, high quality appliances. In the laundry room, you will find your washing machine and truck. 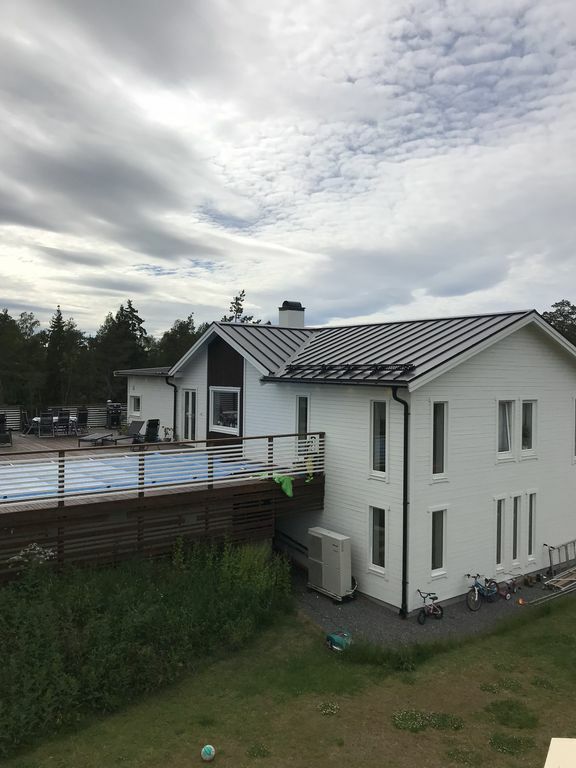 The perfect house for your holidays in Sweden with heated outdoor pool and whirlpool. This property also offers well-spaced areas for relaxing and social gatherings. It is suitable for a larger family or two smaller families making holidays together. It takes about 15 minutes by car to get to the city center of Stockholm and it also takes about 15 minutes by car to get to the nearest bathing place at the Baltic Sea. Here you have the option to rent a boat to explore the wonderful archipelago ("the archipelago"). Our house features Wifi, Boxer TV, Xbox and Apple TV. Full kitchen with high quality equipment.